Sweet and Sour Bitter Gourd pickle is a classic Kerala Pickle, spicy, tangy and certainly not bitter. Bitter Gourd is loaded with nutrients and minerals and is great for diabetes patients, as it has blood sugar controlling properties. 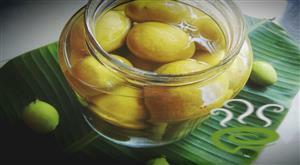 Pavakka, also known as Kaipakka and Karela, aids in lowering the cholesterol levels as well. Bitter gourd Pickle is deliciously spicy and flavorful. Try this wonderful recipe for Bitter Gourd Pickle and pep up your meals. 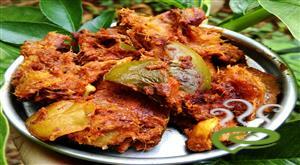 Puli Inji-Sweet&Sour Pickle is a tasty ginger pickle usually served as an appetizer in Keralas onam sadhya.The main ingredients of this recipe are ginger,tamarind and jaggery. 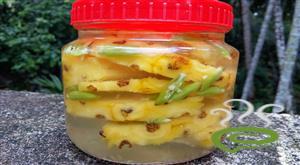 Whenever you want to eat something spicy and good you can prepare this wonderful pickled pineapple recipe which brings back my childhood and college memories. Dates Pickle can be made and kept for the next season. Uppilitta kannimanga is a delicious accompaniment with kanji,rice etc.This is a type of oil free pickle that we can make easily.There are some variations like. Some people add in kanthari Mulak or normal chillies for an extra added spice but I chose to omit all that. Now let's see how it is made. My Mother-in-law has her own special recipe of making pickles,this Mango Pepper Pickle is one among that secret recipe.It is a spicy mango pickle made with Raw mango,pepper,cumin seed,fenugreek seeds and mustard seeds. 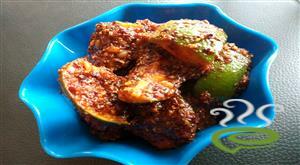 Kerala Sun Dried Mango Pickle is a yummy pickle with a spicy aromatic flavor. Kerala Sun Dried Mango Pickle should be dried properly in sun. These pickles have longer shelf life compared to other normally prepared pickles. Kerala Sun Dried Mango Pickle tastes great with hot rice. The pickle can be easily prepared at home with limited ingredients. Dried mangoes are nutritious and tasty. 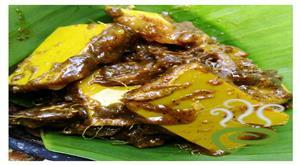 You can explore a well detailed Kerala Sun Dried Mango Pickle here. Beetroot Dates Pickle is a yummy, spicy, tangy and sweet flavored side dish, very popular in Malabar region that tastes best with Biriyani dishes. Beetroot Dates Pickle adds spice to your dishes making it tempting and irresistible. Colorful Beetroot Dates Pickle is packed with nutrients and the healthy pickle can be easily prepared at home. The pickle dish is unique and special with grated beetroot and chopped dates blended with spicy ingredients. This is an instant dish which requires very little time for preparation. 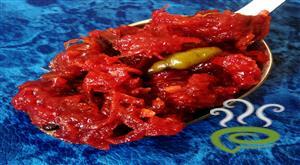 You can explore a well detailed Beetroot Dates Pickle dish here. Pickle Powder is a simple aromatic powder prepared with only few ingredients readily available in your kitchen. This is normally used while preparing pickles at your home to improve the aroma and taste of the pickle. This is a south indian style home - made pickle powder (oorugai podi) which can be used for cut mango pickles, mango thokku etc. 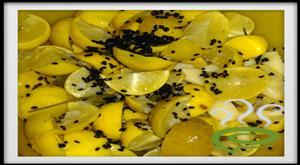 spicy raw mango is simple and easy recipe for side dish. it goes well with any variety rice. the spicy raw mango particularly goes well with curd rice. The raw mango pieces are mixed with spicy chilli powder and tempered with mustard, asafoetida. 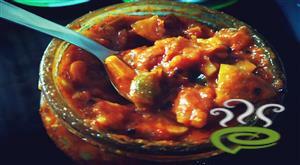 Tomato pickle recipe, a simple, instant, tasty and best tomato pachadi Andhra style preparation. .Dry roast methi seeds and cumin seeds, until you begin to smell good. Cook tomatoes in the same pan with salt added. Cover and cook until the tomatoes mash up well to soft textute. Add chili powder, turmeric and ginger garlic paste to it. Mix well and add the seasoning that we set aside. 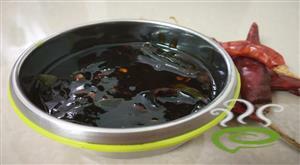 Mix and cook until the oil separates.The tomato pickle goes very well with rice,idli and dosa. 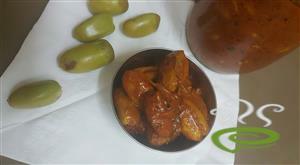 Dates and lemon pickle is a sweet,sour,and hot side dish that everyone will love this special combination.Both lemon and dated have major health bennefits and it this simply yet delicious pickle goes well with Biriyani,Ghee rice etc. this is both sweet and sour mango pickle. this is my most favorite and its small with different aroma. because i used funnel seed and so its different with other pickle . its taste is very good and feeling yummy. i used little sour ans sweet mango which is rind is raw and pulp is sweet. if you get like ta try this pickle. its awesome.